Browse and search existing lists from the program and public databases with the List Manager. 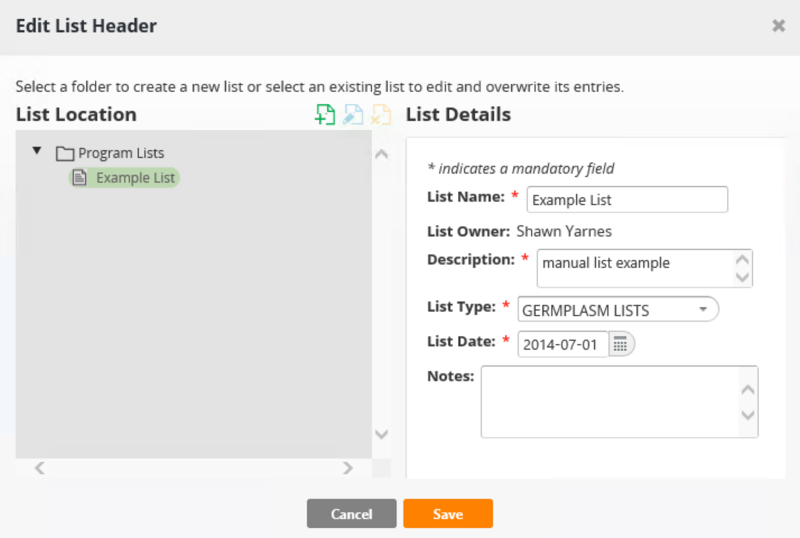 Use the List Manger to create and save new germplasm lists to the program database. See more on importing a new germplasm list. Selecting Search will reveal a popup window. Enter partial or exact list or germplasm information to find matching lists. Selecting Browse will reveal a popup window containing a collapsible file directory of all lists, germplasm lists as well as lists of Nurseries and Trials. Files are split between program database and public database sections. You cannot modify files in the public database. Add a new folder to program lists by selecting Program Lists and the green + icon and entering a new folder name. Rename a program file by selecting the blue pen icon. Click OK.
Delete a file from the program directory by selecting the yellow X icon. Click Yes. Highlight a list and double click to reveal contents. Default columns of data define Germplasm. Double click a column header to sort the list by column values. Select individual Designations or GIDs (germplasm identifiers) to reveal germplasm details. Select germplasm of interest in and drag and drop the selections into the build a new list window. Enter the list details. The list name must be unique to the program database. The newly created list now appears in the Program Lists file folder. The list can be renamed by selecting the pen icon and locked against further editing by selecting the lock icon. Search by exact matches or partial matches to list names, germplasm designations, or GIDs (germplasm IDs). The search feature can also provide parental information. Searches are not case-sensitive. Notice that the Build a New List pane started in the browse list tab remains open when you move to the Search tab. A search of the cowpea database for 40398 reveals germplasm matching GID 40398 as well as the parents of this germplasm. Notice that GI 40398 was not found associated with any existing program database lists, only the public database. Review the seed inventory by selecting Inventory View from the Actions dropdown menu. Reserve seed from selected germplasm inventory view by choosing Reserve Inventory from the Actions dropdown menu. Specify the amount of seed to reserve.